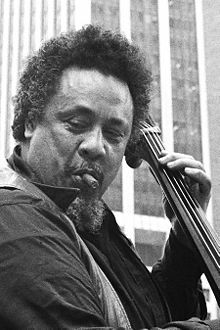 Charles Mingus Jr. (April 22, 1922 – January 5, 1979) was an American jazz double bassist, pianist, composer and bandleader. 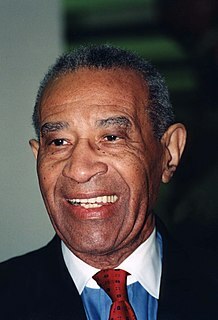 A major proponent of collective improvisation, he is considered to be one of the greatest jazz musicians and composers in history,  with a career spanning three decades and collaborations with other jazz legends such as Louis Armstrong, Duke Ellington, Charlie Parker, Dizzy Gillespie, Dannie Richmond, and Herbie Hancock. 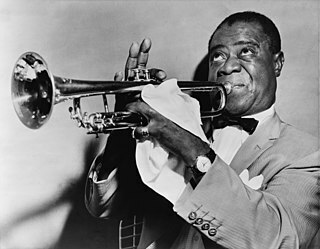 Louis Daniel Armstrong, nicknamed Satchmo, Satch, and Pops, was an American trumpeter, composer, vocalist and occasional actor who was one of the most influential figures in jazz. His career spanned five decades, from the 1920s to the 1960s, and different eras in the history of jazz. In 2017, he was inducted into the Rhythm & Blues Hall of Fame. Mingus' compositions continue to be played by contemporary musicians ranging from the repertory bands Mingus Big Band, Mingus Dynasty, and Mingus Orchestra, to the high school students who play the charts and compete in the Charles Mingus High School Competition. In 1993, The Library of Congress acquired Mingus's collected papers—including scores, sound recordings, correspondence and photos—in what they described as "the most important acquisition of a manuscript collection relating to jazz in the Library's history". The Mingus Big Band is an ensemble, based in New York City, that specializes in the compositions of Charles Mingus. It is managed by his widow, Sue Mingus, along with the Mingus Orchestra and Mingus Dynasty. In addition to its weekly Monday night appearance at Jazz Standard in New York City, the Mingus Big Band tours frequently, giving performances and clinics in America, Europe, and other parts of the world. Mingus Dynasty was an American jazz ensemble formed in 1979, just after the death of Charles Mingus, which featured many musicians Mingus recorded or played with. The group was named after the 1959 album Mingus Dynasty. Nogales is a city in Santa Cruz County, Arizona. The population was 20,837 at the 2010 census and estimated 20,407 in 2014. Nogales forms part of the larger Tucson-Nogales combined statistical area, with a total population of 1,027,683 as of the 2010 Census. The city is the county seat of Santa Cruz County. Watts is a neighborhood in southern Los Angeles, California. It is located within the South Los Angeles region, bordering the cities of Lynwood and South Gate to the east and southeast, respectively, and the unincorporated community of Willowbrook to the south. Beneath the Underdog: His World as Composed by Mingus is the autobiography of jazz bassist and composer Charles Mingus. It was first published in 1971, by Alfred A. Knopf. George Sylvester "Red" Callender was an American string bass and tuba player. He is perhaps best known as a jazz musician, but worked with an array of pop, rock and vocal acts as a member of The Wrecking Crew, a group of first-call session musicians in Los Angeles. William Marcel "Buddy" Collette was an American jazz flautist, saxophonist, and clarinetist. He was a founding member of the Chico Hamilton Quintet. Much of the cello technique he learned was applicable to double bass when he took up the instrument in high school. He studied for five years with Herman Reinshagen, principal bassist of the New York Philharmonic, and compositional techniques with Lloyd Reese. Throughout much of his career, he played a bass made in 1927 by the German maker Ernst Heinrich Roth. In 1952 Mingus co-founded Debut Records with Max Roach so he could conduct his recording career as he saw fit. The name originated from his desire to document unrecorded young musicians. Despite this, the best-known recording the company issued was of the most prominent figures in bebop. On May 15, 1953, Mingus joined Dizzy Gillespie, Parker, Bud Powell, and Roach for a concert at Massey Hall in Toronto, which is the last recorded documentation of Gillespie and Parker playing together. After the event, Mingus chose to overdub his barely audible bass part back in New York; the original version was issued later. The two 10" albums of the Massey Hall concert (one featured the trio of Powell, Mingus and Roach) were among Debut Records' earliest releases. Mingus may have objected to the way the major record companies treated musicians, but Gillespie once commented that he did not receive any royalties "for years and years" for his Massey Hall appearance. The records, however, are often regarded as among the finest live jazz recordings. One story has it that Mingus was involved in a notorious incident while playing a 1955 club date billed as a "reunion" with Parker, Powell, and Roach. Powell, who suffered from alcoholism and mental illness (possibly exacerbated by a severe police beating and electroshock treatments), had to be helped from the stage, unable to play or speak coherently. As Powell's incapacitation became apparent, Parker stood in one spot at a microphone, chanting "Bud Powell...Bud Powell..." as if beseeching Powell's return. Allegedly, Parker continued this incantation for several minutes after Powell's departure, to his own amusement and Mingus's exasperation. Mingus took another microphone and announced to the crowd, "Ladies and Gentlemen, please don't associate me with any of this. This is not jazz. These are sick people." This was Parker's last public performance; about a week later he died after years of substance abuse. Mingus often worked with a mid-sized ensemble (around 8–10 members) of rotating musicians known as the Jazz Workshop. Mingus broke new ground, constantly demanding that his musicians be able to explore and develop their perceptions on the spot. Those who joined the Workshop (or Sweatshops as they were colorfully dubbed by the musicians) included Pepper Adams, Jaki Byard, Booker Ervin, John Handy, Jimmy Knepper, Charles McPherson and Horace Parlan. Mingus shaped these musicians into a cohesive improvisational machine that in many ways anticipated free jazz. Some musicians dubbed the workshop a "university" for jazz. Mingus had already recorded around ten albums as a bandleader, but 1956 was a breakthrough year for him, with the release of Pithecanthropus Erectus , arguably his first major work as both a bandleader and composer. Like Ellington, Mingus wrote songs with specific musicians in mind, and his band for Erectus included adventurous musicians: piano player Mal Waldron, alto saxophonist Jackie McLean and the Sonny Rollins-influenced tenor of J. R. Monterose. The title song is a ten-minute tone poem, depicting the rise of man from his hominid roots ( Pithecanthropus erectus ) to an eventual downfall. A section of the piece was free improvisation, free of structure or theme. In 1959 Mingus and his jazz workshop musicians recorded one of his best-known albums, Mingus Ah Um . Even in a year of standout masterpieces, including Dave Brubeck's Time Out , Miles Davis's Kind of Blue , John Coltrane's Giant Steps , and Ornette Coleman's prophetic The Shape of Jazz to Come , this was a major achievement, featuring such classic Mingus compositions as "Goodbye Pork Pie Hat" (an elegy to Lester Young) and the vocal-less version of "Fables of Faubus" (a protest against segregationist Arkansas governor Orval E. Faubus that features double-time sections). Also during 1959, Mingus recorded the album Blues & Roots , which was released the following year. As Mingus explained in his liner notes: "I was born swinging and clapped my hands in church as a little boy, but I've grown up and I like to do things other than just swing. But blues can do more than just swing." Mingus witnessed Ornette Coleman's legendary—and controversial—1960 appearances at New York City's Five Spot jazz club. He initially expressed rather mixed feelings for Coleman's innovative music: "...if the free-form guys could play the same tune twice, then I would say they were playing something...Most of the time they use their fingers on the saxophone and they don't even know what's going to come out. They're experimenting." That same year, however, Mingus formed a quartet with Richmond, trumpeter Ted Curson and multi-instrumentalist Eric Dolphy. This ensemble featured the same instruments as Coleman's quartet, and is often regarded as Mingus rising to the challenging new standard established by Coleman. The quartet recorded on both Charles Mingus Presents Charles Mingus and Mingus . The former also features the version of "Fables of Faubus" with lyrics, aptly titled "Original Faubus Fables". Only one misstep occurred in this era: 1962's Town Hall Concert. An ambitious program, it was plagued with troubles from its inception. Mingus's vision, now known as Epitaph , was finally realized by conductor Gunther Schuller in a concert in 1989, 10 years after Mingus's death. In 1963, Mingus released The Black Saint and the Sinner Lady , a sprawling, multi-section masterpiece, described as "one of the greatest achievements in orchestration by any composer in jazz history." The album was also unique in that Mingus asked his psychotherapist, Dr. Edmund Pollock, to provide notes for the record. Mingus also released Mingus Plays Piano , an unaccompanied album featuring some fully improvised pieces, in 1963. In 1964 Mingus put together one of his best-known groups, a sextet including Dannie Richmond, Jaki Byard, Eric Dolphy, trumpeter Johnny Coles, and tenor saxophonist Clifford Jordan. The group was recorded frequently during its short existence; Coles fell ill and left during a European tour. Dolphy stayed in Europe after the tour ended, and died suddenly in Berlin on June 28, 1964. 1964 was also the year that Mingus met his future wife, Sue Graham Ungaro. The couple were married in 1966 by Allen Ginsberg. Facing financial hardship, Mingus was evicted from his New York home in 1966. By the mid-1970s, Mingus was suffering from amyotrophic lateral sclerosis (ALS). His once formidable bass technique declined until he could no longer play the instrument. He continued composing, however, and supervised a number of recordings before his death. At the time of his death, he was working with Joni Mitchell on an album eventually titled Mingus , which included lyrics added by Mitchell to his compositions, including "Goodbye Pork Pie Hat". The album featured the talents of Wayne Shorter, Herbie Hancock, and another influential bassist and composer, Jaco Pastorius. Mingus died, aged 56, in Cuernavaca, Mexico, where he had traveled for treatment and convalescence. His ashes were scattered in the Ganges River. His compositions retained the hot and soulful feel of hard bop, drawing heavily from black gospel music and blues, while sometimes containing elements of Third Stream, free jazz, and classical music. He once cited Duke Ellington and church as his main influences. Charles Mingus' music is currently being performed and reinterpreted by the Mingus Big Band, which in October 2008 began playing every Monday at Jazz Standard in New York City, and often tours the rest of the U.S. and Europe. The Mingus Big Band, the Mingus Orchestra, and the Mingus Dynasty band are managed by Jazz Workshop, Inc. and run by Mingus' widow Sue Graham Mingus. In Australia, Melbourne based band Mingus Thingus regularly perform Mingus' compositions at the Paris Cat jazz club as part of Melbournes thriving jazz scene. Mingus wrote the sprawling, exaggerated, quasi-autobiography, Beneath the Underdog: His World as Composed by Mingus ,  throughout the 1960s, and it was published in 1971. Its "stream of consciousness" style covered several aspects of his life that had previously been off-record. In addition to his musical and intellectual proliferation, Mingus goes into great detail about his perhaps overstated sexual exploits. He claims to have had more than 31 affairs in the course of his life (including 26 prostitutes in one sitting). This does not include any of his five wives (he claims to have been married to two of them simultaneously). In addition, he asserts that he held a brief career as a pimp. This has never been confirmed. Considering the number of compositions that Charles Mingus wrote, his works have not been recorded as often as comparable jazz composers. The only Mingus tribute albums recorded during his lifetime were baritone saxophonist Pepper Adams's album, Pepper Adams Plays the Compositions of Charlie Mingus , in 1963, and Joni Mitchell's album Mingus , in 1979. Of all his works, his elegant elegy for Lester Young, "Goodbye Pork Pie Hat" (from Mingus Ah Um ) has probably had the most recordings. Besides recordings from the expected jazz artists, the song has also been recorded by musicians as disparate as Jeff Beck, Andy Summers, Eugene Chadbourne, and Bert Jansch and John Renbourn with and without Pentangle. Joni Mitchell sang a version with lyrics that she wrote for it. Elvis Costello has recorded "Hora Decubitus" (from Mingus Mingus Mingus Mingus Mingus ) on My Flame Burns Blue (2006). "Better Git It in Your Soul" was covered by Davey Graham on his album "Folk, Blues, and Beyond." Trumpeter Ron Miles performs a version of "Pithecanthropus Erectus" on his CD "Witness." New York Ska Jazz Ensemble has done a cover of Mingus's "Haitian Fight Song", as have the British folk rock group Pentangle and others. Hal Willner's 1992 tribute album Weird Nightmare: Meditations on Mingus (Columbia Records) contains idiosyncratic renditions of Mingus's works involving numerous popular musicians including Chuck D, Keith Richards, Henry Rollins and Dr. John. The Italian band Quintorigo recorded an entire album devoted to Mingus's music, titled Play Mingus. Gunther Schuller's edition of Mingus's "Epitaph" which premiered at Lincoln Center in 1989 was subsequently released on Columbia/Sony Records. One of the most elaborate tributes to Mingus came on September 29, 1969, at a festival honoring him. Duke Ellington performed The Clown, with Duke reading Jean Shepherd's narration. It was long believed that no recording of this performance existed; however, one was discovered and premiered on July 11, 2013, by Dry River Jazz host Trevor Hodgkins for NPR member station KRWG-FM with re-airings on July 13, 2013, and July 26, 2014. Mingus's elegy for Duke, "Duke Ellington's Sound Of Love", was recorded by Kevin Mahogany on Double Rainbow (1993) and Anita Wardell on Why Do You Cry? (1995). 1971: Guggenheim Fellowship (Music Composition). 1971: Inducted in the Down Beat Jazz Hall of Fame. 1995: The United States Postal Service issued a stamp in his honor. 1997: Posthumously awarded the Grammy Lifetime Achievement Award. 1999: Album Mingus Dynasty (1959) inducted in the Grammy Hall of Fame. 2005: Inducted in the Jazz at Lincoln Center, Nesuhi Ertegun Jazz Hall of Fame. 1959, Mingus contributed most of the music for John Cassavetes's gritty New York City film Shadows . 1961, Mingus appeared as a bassist and actor in the British film All Night Long . 1991, Ray Davies produced a documentary entitled Weird Nightmare. It contains footage of Mingus and interviews with artists making Hal Willner's tribute album of the same name, including Elvis Costello, Charlie Watts, Keith Richards, and Vernon Reid. Charles Mingus: Triumph of the Underdog (78 minutes) a documentary film on Charles Mingus directed by Don McGlynn and released in 1998. Charles Parker Jr., also known as Yardbird and Bird, was an American jazz saxophonist and composer. Eric Allan Dolphy, Jr. was an American jazz alto saxophonist, bass clarinetist and flautist. On a few occasions, he also played the clarinet and piccolo. Dolphy was one of several multi-instrumentalists to gain prominence around the time that he was active. His use of the bass clarinet helped to establish the instrument within jazz. Dolphy extended the vocabulary and boundaries of the alto saxophone, and was among the earliest significant jazz flute soloists. Maxwell Lemuel Roach was an American jazz drummer and composer. A pioneer of bebop, he worked in many other styles of music, and is generally considered alongside the most important drummers in history. He worked with many famous jazz musicians, including Coleman Hawkins, Dizzy Gillespie, Charlie Parker, Miles Davis, Duke Ellington, Thelonious Monk, Abbey Lincoln, Dinah Washington, Charles Mingus, Billy Eckstine, Stan Getz, Sonny Rollins, Eric Dolphy, and Booker Little. He was inducted into the DownBeat Hall of Fame in 1980 and the Modern Drummer Hall of Fame in 1992. 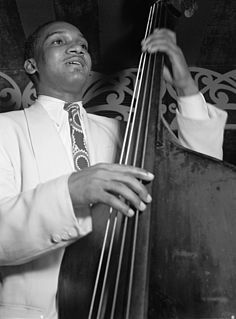 Oscar Pettiford was an American jazz double bassist, cellist and composer. He was one of the earliest musicians to work in the bebop idiom. James Minter Knepper was an American jazz trombonist. In addition to his own recordings as leader, Knepper performed and recorded with Charlie Barnet, Woody Herman, Claude Thornhill, Stan Kenton, Benny Goodman, Gil Evans, Thad Jones and Mel Lewis, Toshiko Akiyoshi and Lew Tabackin, and, most famously, Charles Mingus in the late 1950s and early 1960s. Knepper died in 2003 of complications of Parkinson's disease. John Arthur "Jaki" Byard was an American jazz multi-instrumentalist, composer and arranger. Mainly a pianist, he also played tenor and alto saxophones, among several other instruments. He was known for his eclectic style, incorporating everything from ragtime and stride to free jazz. Harry Howell Carney was a jazz saxophonist and clarinettist who spent over four decades as a member of the Duke Ellington Orchestra. Epitaph is a composition by jazz musician Charles Mingus. It is 4,235 measures long, takes more than two hours to perform, and was only completely discovered during the cataloguing process after his death. With the help of a grant from the Ford Foundation, the score and instrumental parts were copied, and the work itself was premiered by a 30-piece orchestra, conducted by Gunther Schuller and produced by Mingus's widow, Sue, at Alice Tully Hall on June 3, 1989, 10 years after his death, and issued as a live album. It was performed again at several concerts in 2007. Debut Records was an American jazz record company and label founded in 1952 by bassist Charles Mingus, his wife Celia, and drummer Max Roach. Money Jungle is a studio album by pianist Duke Ellington with double bassist Charles Mingus and drummer Max Roach. It was recorded on September 17, 1962, and released in February 1963 by United Artists Jazz. All but one of the compositions were written by Ellington, with four of the seven on the original LP being recorded for the first time on this album. Later releases on CD added eight tracks from the same recording session. Jazz at Massey Hall is a live jazz album featuring a performance by "The Quintet" given on 15 May 1953 at Massey Hall in Toronto. The quintet was composed of several leading 'modern' players of the day: Dizzy Gillespie, Charlie Parker, Bud Powell, Charles Mingus, and Max Roach. It was the only time that the five men recorded together as a unit, and it was the last recorded meeting of Parker and Gillespie. Howard Robert "Bob" Hammer is an American jazz pianist, composer and arranger. A Modern Jazz Symposium of Music and Poetry is an album by jazz bassist Charles Mingus. In spite of the title, the album does not contain any poetry. "Scenes in the City", however, includes narration performed by Mel Stewart and written by actor Lonne Elder with assistance from Langston Hughes. The composition "Duke's Choice" re-appears, in updated form, as "I X Love" on the 1963 album Mingus Mingus Mingus Mingus Mingus. "Nouroog", "Duke's Choice" and "Slippers" form the basis of the suite "Open Letter to Duke" on Mingus Ah Um. Mingus Revisited is an album by jazz bassist and composer Charles Mingus consisting of music that was composed before Mingus first heard Charlie Parker, hence the Pre-Bird title. The music is scored for various sized large jazz ensembles and features many soloists prominent at the time of recording. The album includes two tracks which are contrapuntal arrangements of two swing era pieces, whereby "Take the "A" Train" is paired with a simultaneous "Exactly Like You", and likewise "Do Nothin' Till You Hear From Me" with "I Let a Song Go Out of My Heart". Tracks 1 to 3, 5 and 6 recorded May 25, 1960 probably at Plaza Sound, New York City; tracks 4, 7 and 8 recorded May 24, 1960 at Plaza Sound, New York City. Charles Mingus: Triumph of the Underdog is a 1997 documentary film about the life of jazz musician Charles Mingus. As a bandleader, the American jazz bassist Charles Mingus released 51 albums between 1949 and 1977; as a sideman, Mingus appeared on a total of 34 albums. 4 albums of his music were recorded posthumously between 1979 and 1990. While the horn is primarily used in classical music pieces, in the mid-20th century the French horn broke into the jazz world. While the instrument remains relatively rare, the role of the horn in jazz has developed from its beginnings in the 1940s through to the 2010s. Note that the expression "horns" in jazz is often used colloquially to refer to all brass instruments used in jazz. This article focuses on the use of the French horn. Mingus is an album by jazz bassist and composer Charles Mingus. The album was recorded in October and November 1960 in New York for Nat Hentoff's Candid label. ↑ Ernest Barteldes (February 18, 2009). "Thirty Years On, The Music Remains Strong; Charles Mingus's legacy revisited at the Manhattan School of Music". Nypress.com. Archived from the original on April 14, 2014. Retrieved October 26, 2009. ↑ Jenkins, Todd (2006). I Know What I Know: The Music of Charles Mingus. Greenwood Publishing Group. p. 5. 1 2 Horton, Ernest Aaron (2007). "Charles Mingus and the Paradoxical Aspects of Race as Reflected in His Life and Music" (PDF). Doctoral dissertation, University of Pittsburgh. Retrieved October 11, 2011. 1 2 3 Mingus, Charles: Beneath the Underdog: His Life as Composed by Mingus. New York, NY: Vintage, 1991. ↑ "Charles Mingus | Charles "Baron" Mingus: West Coast, 1945–49". Allaboutjazz.com. February 1, 2001. Retrieved October 8, 2009. ↑ Jazz Discography Project. "Charles Mingus Catalog". Jazzdisco.org. Retrieved October 8, 2009. ↑ Hentoff, Nat (1978). Jazz Is. W.H. Allen. pp. 34–35. 1 2 Santoro, Gene. Myself When I Am Real: The Life and Music of Charles Mingus. New York: Oxford UP, 2000. Print. ↑ "Town Hall Train Wreck". Villagevoice.com. Retrieved November 3, 2018. ↑ Gene Santoro (June 6, 2000). "Town Hall Train Wreck". The Village Voice. Retrieved July 23, 2015. ↑ Review at Allmusic, by Steve Huey. Retrieved December 5, 20115. ↑ Hentoff, Nat (1963). Liner Notes, Mingus Mingus Mingus Mingus Mingus. ↑ "Jazz". AllAboutJazz.com. January 5, 1979. Archived from the original on November 12, 2011. Retrieved October 8, 2009. ↑ Blanchet, Benjamin. "Spring semester of '71", The Spectrum, University at Buffalo, The State University of New York, 21 November 2016. Retrieved on 21 November 2016. ↑ David Simpson. "Myself When I Am Real: The Life and Music of Charles Mingus, by Gene Santoro". Jazz Institute of Chicago book review. Retrieved March 25, 2008. ↑ Jon Pareles, "An irrepressible '65 Mingus concert", The New York Times, September 23, 1984. ↑ Carroll, Christopher (12 February 2013). "Mingus: The Chaos and the Magic". The New York Review of Books. Retrieved 22 February 2019. ↑ Will Friedwald. "Paris When He Sizzles". Village Voice. ↑ Voce, Steve (June 16, 2003). "Jimmy Knepper – Obituaries, News". The Independent. London. Archived from the original on September 3, 2010. Retrieved October 8, 2009. ↑ Shatz, Adam. "An Argument With Instruments: On Charles Mingus | The Nation". ISSN 0027-8378 . Retrieved 2018-10-11. ↑ "Mingus 1968" . Retrieved October 12, 2011. ↑ "Tonight at Noon: Three of Four Shades of Love". Album overview on Allmusic. ↑ Ratliff, Ben (January 18, 1998). "JAZZ VIEW; Hearing Mingus Again, Seeing Him Anew". The New York Times. Retrieved October 8, 2009. ↑ "Jazz: Beneath the Underdog". Time. October 2, 1964. Retrieved October 8, 2009. ↑ Crawley, Ashon T. 2017. Blackpentecostal Breath: The Aesthetics of Possibility. New York: Fordham University Press. ↑ "New York Public Library Web Server 1". Catalog.nypl.org. Retrieved November 3, 2018. ↑ "Library of Congress Acquires Charles Mingus Collection", June 11, 1993. Library of Congress press release. ↑ Hodgkins, Trevor. "Dry River Jazz 07/26/2014". Composer.nprstations.org. ↑ Rule, Sheila. "Library of Congress Buys Charles Mingus Archive". Query.nytimes.com. Retrieved November 3, 2018.